We’ve created a list of toys that can play an essential part in developing your baby’s senses, coordination and social skills, from newborn to toddler. Let's take a look at the best baby development toys to give your little ones the best start in life. Parenting is a daunting task, and often you’re never quite sure whether you’re doing it right, or not. People will argue that there isn’t a ‘right way’ to parent. Every baby is different and just because your friend’s baby sleeps through the night and yours doesn’t, doesn’t mean you’re doing anything wrong. But whether you’re due to pop at any minute or your cradling your newborn in a last exhaustive attempt to send them to sleep, there are plenty of toys out there that you can invest in which will naturally help them to develop their skills as they grow. Many toys have been specially designed to aid your baby’s natural development. From newborn through to toddler, it’s important for your baby to explore their senses, so toys are often brightly coloured to stimulate sight; musical to stimulate their hearing; and are often made using textured materials, so their sense of touch is developed, too. As your baby drifts through the different stages of development, toys can be used to help and support them. For example, newborn toys are usually soft, comforting and calming. After two months, hearing typically becomes more heightened, so many toys then become musical or feature a range of different sound effects. At five months, they typically start associating cause with effect, so toys become even more interactive and after six months, they may start using simple hand and eye coordination. From fluffy musical animals to baby gyms, interactive platforms to teething toys, discover a range of the best development toys here on TheRadar. If you are looking for reading materials for you and your little one, check out our guide to 11 classic baby books. 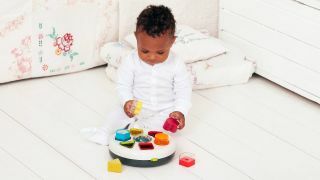 Suitable for babies from six months old, this table can be used as a floor toy at first, helping little ones to develop their fine motor skills through a combination of buttons and switches. Gross motor skills are also nurtured, thanks to the merry tunes which encourage them to wiggle around and find their groove. As they start to explore their world from their feet, you can attach the legs to transform it into a table. When you feel your child is ready, you can switch it to learning mode, so you can encourage them to become familiar with the alphabet, basic numbers, shapes and colours. If you wish, you can even switch it to bilingual mode, and give your child a head start at learning French. This gym features a selection of mobiles and switches which have been designed to develop your baby’s senses, through rattling, crackling or singing. Thanks to its diverse design, newborns can lie with their head and neck supported; tummy time is catered for with a soft mat; and you can encourage them to sit up or stand with an interactive ball drop game. This is all aided by the detachable mobiles and switchable legs, which you can change easily as and when your baby is ready. At six months old, your baby is only just discovering cause and effect, so don’t worry if they take a while to figure out this shape sorter toy. In the meantime, each shape is different in texture and sound so your little one can continue to explore their senses. The shapes are very durable, so they’ll resist the bashing around they’ll receive as your baby figures out how to put a shape successfully in a hole. Once a shape enters the correct slot, the toy will light up and play a tune, reinforcing cause and effect and developing their hand-eye coordination. Designed by sleep experts, Ollie the Owl has been created to help babies (and you) achieve a good night’s sleep. There’s four comforting sounds to choose from, including white noise, heartbeat, rainfall and lullaby, and they’ll play for 20 minutes while you both drift off. Thanks to Ollie’s cry sensor, he’ll start automatically playing a sound as soon as your baby starts to whimper, gently sending them back to sleep, while the warm light and soft wings are so your baby can self comfort if you still happen to be in the land of nod. Reviewers do find that he likes to eat batteries, but a good night’s sleep is certainly worth the expense and you can always dust off some rechargeable triple As. Cute and softly coloured, Sophie la Girafe is, according to many users, their baby’s number one teething toy. Soft, flexible and with lots of different parts to chew on, it’s the perfect shape for soothing sore gums. Made from soft rubber, it can also be used as a play toy and squeaks when squeezed, helping your baby to learn cause and effect. You may find Sophie is more of a designer teething toy, but perfect if you can’t help splashing out on your little one. The perfect toy to keep with them at all times, this peacock is brightly coloured and multi-textured to help develop your baby’s sight and touch senses. Each wing has its own unique design, with one featuring a mirror to help with your baby’s self discovery. If you’re on the road or at a friend’s house, the toy also features a hook so you can hang it from the handle of the carrycot, pram or car seat. The only downside is it doesn’t come with musical interaction, making it the best development toy for earlier months. Aside from refining your baby’s choice in music, this device nurtures your baby’s auditory processing by playing music, and their visual perception by lighting up. It has the ability to play up to seven tunes with a push of the button and it’s far more baby friendly than your iPad, with a sturdy, durable design, caterpillar handle and on-screen flashing lights. Reviewers find their baby is fascinated by the interactiveness of the toy, though some say the music isn't particularly loud - which could be a good thing for you!